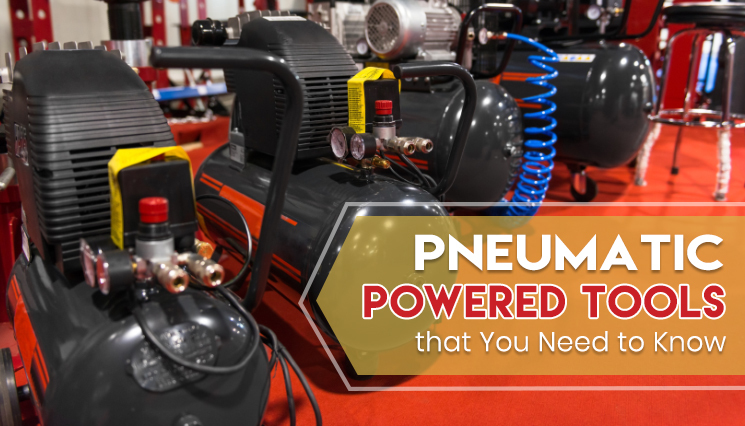 PNEUMATIC Powered Tools that You Need to Know | Compresstech Resources, Inc.
A lot of people make the mistake of considering air compressors as tools when in fact, it is an equipment that uses pressurized air to power up a range of tools. That’s right. Not all powered tools use battery or electrical supply, some require pressurized air and these are the not-so-conventional air compressor powered tools. Air compressor is essential for various applications. It has been given greater preference especially in a range of industries because of the speed and precision it offers that work effectively whether it be for construction, auto works and maintenance, woodwork, and a lot more. Given the technological advancements that further its versatility, the range of tools that use compressed air has also expanded–enabling smoother and faster operations. And to be specific, here we highlight the range of benefits that come with air compressor powered tools. High Power to Weight Ratio. Air compressor powered tools come with simple and lighter air motors or pistons which make them more convenient to use than cordless tools with the same power rating. Longer Life. Even when stalled for an indefinite period of time, air compressor powered tools wouldn’t burn out. Ease of Use. With less working parts as compared with electric tools, air compressor powered tools reduce complexities. They also enable portability as they don’t come with bulky motors. Electrocution Safe. Unlike electricity powered tools that come with the risk of electrocution, air compressor powered tools are safe enough to be used even in damp conditions. Want to know more? The following section focuses on air compressor powered tools that the handyman in you would be interested to know. Often used for woodworks and construction, air compressor powered drills allow precise drilling of holes in a fraction of time. Whether you will be boring holes through wood, thick boards, or metals, the risk of overheating is very rare. Eliminate difficulty in sanding with an air compressor powered tool that comes with a durable and lightweight design. Unlike the typical sanding process that usually leave marks along surfaces, an air sander moves in a random manner to produce smooth and high-quality finish. Specially designed for metalworks and construction purposes, air grinders trim and cut through even strong materials. Certainly a dependable tool, air grinders have also been used for rescue operations. Designed to perform a range of cutting applications, an air hammer can carve stone and cut metal which make it the choice of tool especially among crafts persons. Unlike wrenches that require tedious arm and wrist movement, an air ratchet is ideally used to eliminate the difficulty in handling bolts especially with metal works, auto works, and construction. Aside from eliminating the physical pain and difficulty when sawing materials, an air saw also allow you to saw through materials to achieve cuts with fine edges and precision even in a fraction of time. If metal works demands cutting tasks that are usually done on paper, air shears would be your essential tool. An air shear has a blade that cuts squares, angles and circles through metals. Perfect for plastics and all kinds of aluminum, tin and steel. It is used to tighten and loosen bolt delivering high torque output with only minimal exertion. One of the most compact tools available, it is more suitable when you’re working in confined spaces. When it comes to air compressor powered tools, Compresstech delivers the products used by professionals. Visit our website to know what we offer.